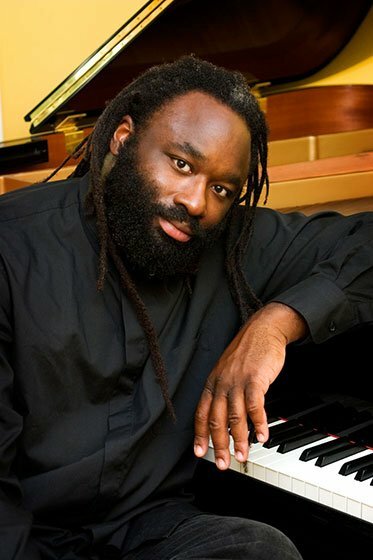 Boston Conservatory welcomed Awadagin Pratt to Seully Hall for its Piano Masters Series. A winner of the Naumburg International Piano Competition, Pratt also has the distinction of being the first student at Peabody Conservatory to receive diplomas in three performance areas: piano, violin, and conducting. He triumphed Monday in exceptionally demanding Romantic works. At opposite ends of the program Pratt placed compositions by the leaders of the two major aesthetic camps (with no love lost between them) in Austrian-German music in the mid-19th century: the Variations and Fugue on a Theme of Handel by Johannes Brahms, of the conservative group; and the Sonata in B Minor by Franz Liszt who, with Richard Wagner, spearheaded the “Music of the Future” movement. (Interestingly, Wagner had words of praise for both the works we heard; at least the man was intellectually honest.) In Pratt’s hands one could hear both Brahms’s affection for older music as well as some surprising prefigurings of music decades ahead. Also, as this is one of the most overtly showy pieces to come from Brahms’s pen, Pratt gave us lots of fireworks. Variations 4, 14, and 25 had plenty of go-for-broke bravura, never guarded, but unfailingly accurate. Var. 6 was mysterious under a thin sheen of pedal; the many chromatic progressions of Var. 9 seemed almost modern in the blur of heavy pedaling, but the musette/children’s song of Var. 22 seemed a bit too impressionistic in a similar haze. Brahms rather cruelly puts the grand fugal finale (a workout in itself) after the single most strenuous variation (25), but the pianist had abundant power in reserve. Whether polyphonic or homophonic, textures were always kept clear, and the driving rhythm never flagged on the way to an extremely powerful ending. The Chaconne in D Minor from Johann Sebastian Bach’s Partita No. 2 for solo violin is surely one of the summits of the violin literature, striking awe if not fear in the hearts of all but the most virtuosic players. Its fierce technical challenges, as much as its sublime music, might well have motivated Ferruccio Busoni to make an “arrangement” for piano making similarly transcendent demands. Busoni doesn’t attempt too often to evoke the string instrument, nor did Pratt, in what is essentially a work for piano loosely based on Bach. In essence, it is another set of variations for piano, and Pratt delivered plenty of variety in contrasting articulations, dynamics, textures, etc. (one wonders if Pratt’s experience as a violinist motivated him to learn this transcription and had any effect on his interpretation). The surprising appearance of the major was artfully done, and the later transition back to minor was soulful. One passage of chromatic thirds became murky with excess pedal, but the colossal chords near the conclusion were jolting and the final cadence Olympian. The Sonata in B Minor, occupying a comparable place of prestige in the oeuvre of Franz Liszt to that of the Handel Variations in Brahms’s, is largely based on a handful of themes that undergo numerous metamorphoses. It is a half-hour of continuous music without separate movements which Pratt played in the grand manner, employing large but convincing rubati and a huge range of tempo and dynamics; he commanded a staggering sound. At its peak, though, in the great chordal theme heard early on and recurring a few other times, it could turn slightly harsh. The artist confronted every challenge with fearless virtuosity. Leaping double octaves began at an impressively fast tempo and accelerated to a hair-raising one in an example from the early part of the work. In contrast, the slower, more intimate passages were lyrical and beautiful, with caressing flexibility and deeply infused with Sehnsucht (roughly, yearning). A special moment was the sequence of soft descending scales when Pratt’s silvery tone evoked gleaming water-droplets in a sun-shower. The recapitulation of the turbulent exposition was, if anything, even more exciting than before, full of lightning bolts and booming bass thunder. In the spent coda the performer used subtle rubato to heighten the yearning, withholding until the last possible minute the resolution to a blessed B major. After the final bottom B purred ppp, there was a long, rapt silence before a fervent standing ovation. The powerful 19th-century Viennese critic Eduard Hanslick, firmly in the conservative camp, said of this sonata: “Anyone who has heard it and finds it beautiful is beyond help.” If so, we had a recital hall full of people beyond help. The audience strongly sought an encore—a miniature perhaps?—but Pratt had more than earned a rest. We shall have to await, with Sehnsucht, his next local appearance.